Today, half of all the children in Mechelen that are 11 years old and younger come from an immigrant background. That means either themselves, their parents, or their grandparents were born in another country. With 128 different nationalities represented in this town of about 82,000, it’s worth asking what that means for one’s identity? And it’s not just in Mechelen. One in six people in Flanders (the Dutch speaking part of Belgium) was born outside Belgium or to foreign parents, according to the Flemish Integration Monitor report. The report says that 1,114,792 million people living in Flanders are of foreign origin. What does that mean for one’s identity? They say variety adds spice to life, and I’d say diversity does too. It’s all-too-easy to see the link between “diversity” and “division,” not only in the shared root of the two words but also in daily life. There’s no doubt that for different cultures to live together peacefully, it takes a lot of time, effort, and openness on the part of everybody. Yet it’s equally the case that the more diverse your community is the more possibilities there are to weave your identity into a richer and more colorful social fabric. If you look outside of politics, I find that most people not only accept diversity in their lives, but that they actually seek it out and embrace it. Travel is just one way to experience a different culture. Closer to home there are foods, music, books, friends, neighbors – unless you live on the moon, you can’t escape the influence of other cultures in your day to day life. And if you’re like me, you’d be lost without it. Here’s a question. Think about where you’re from. How would you draw someone from your city or country? 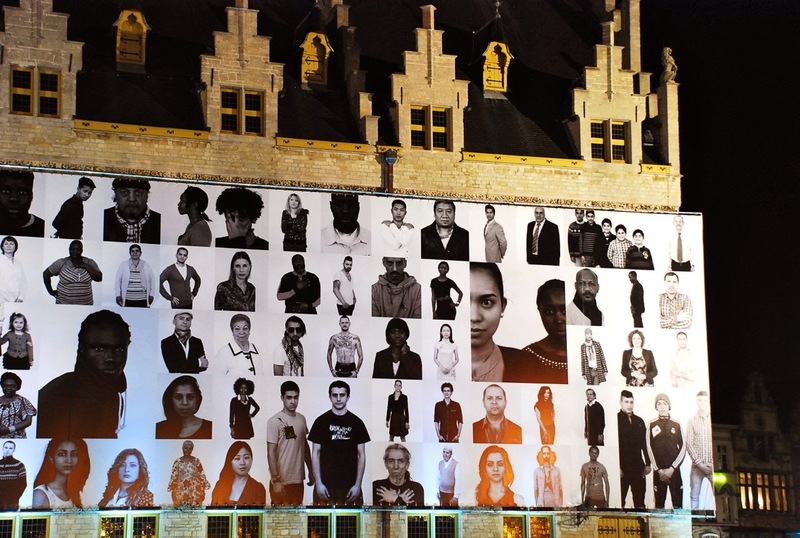 From now until September, you can find this giant poster on the wall of the post office in the center of Mechelen. 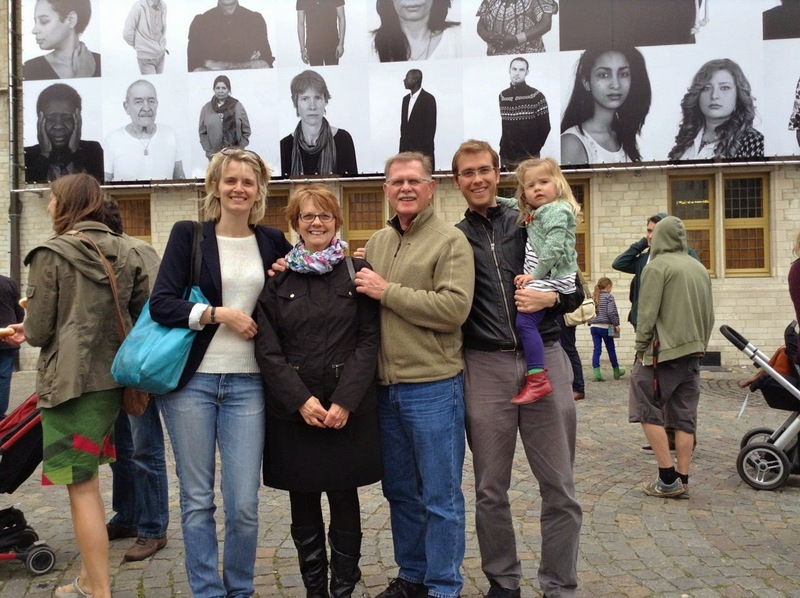 Each of the 128 people pictured lives in Mechelen, but comes from a background outside of Belgium. “Where’s John?” you ask. I was photographed, but didn’t make the final cut. I always knew I looked too Belgian! Oh well, I had a great time at the opening last Sunday and was very proud to be able to celebrate the occasion with my parents (who are visiting from the US), my wife (who was one of the minority all-Belgian’s in the crowd), and my daughter (the next generation of multi-cultural Belgians/Americans/citizens of the world). Unanimous agreement on anything by the 28 member states of the European Union is as rare as a nun in a bikini. Except, it seems, on the issue of the death penalty. The botched execution by lethal injection of Clayton D. Lockett this week in Oklahoma prompted an outpouring of condemnation from all corners of Europe of the American justice system. On that note, um, check out my latest postcards.